Two Georgia players were arrested and charged with misdemeanor disorderly conduct following a bar fight in the early morning hours on Sunday. Senior wide receiver Tyler Simmons and true freshman cornerback Tyrique Stevenson were cited following a bar fight that occurred at the Cloud Bar in downtown Athens. Seth Emerson of The Athletic tweeted the release from the Athens Clarke-County Police. Stevenson was booked into Athens Clarke-County jail at 2:42 a.m. on Sunday morning, according to 247Sports. Simmons was not booked into jail because he was taken to the hospital after complaining of injuries. The extent of his injuries are unknown at this time. Simmons has been a contributor for the Bulldogs during each of his three seasons with the program. He caught nine passes for 138 yards and two touchdowns in 2018, and rushed for 131 yards and two more scores. With four of the five top receivers from last year's squad gone, the speedster is in line to see a big bump in playing time for the Bulldogs. The senior gained notoriety during the 2018 College Football National Championship Game following the 2017 season, when he blocked a punt in the third quarter against Alabama only to have it called back due to a debatable offsides call. Stevenson is a true freshman early enrollee from Homestead, Florida. The four-star prospect, who was ranked No. 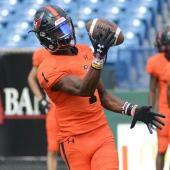 34 overall in the class of 2019, was also a candidate for early playing time in a new-look Georgia secondary. He was the fourth-best prospect in Georgia's class, which finished second in the country. Georgia has not issued a statement on the status of Simmons and Stevenson. It's more bad news for a program that has had other players get into legal trouble this offseason. Sophomore linebacker Jaden Hunter was charged with driving with a suspended license last week, and sophomore safety Latavious Brini was charged with simple battery last month.